We investigated the migratory movements of silver-haired bats (Lasionycteris noctivagans) across the eastern extent of the species’ range. We conducted stable hydrogen isotope analysis of fur samples (δ2Hfur) from museum specimens collected across latitudes and at all times of the year. We first used these data to estimate the timing of fur replacement and to develop a model associating δ2Hfur with that of local precipitation (δ2Hprecip) at the location where fur replacement occurred. We then used this model to 1) identify individuals that had migrated across latitudes, and 2) investigate the presence of continental-scale patterns in the estimated distance traveled. Bats were at their location of fur replacement between 20 June and 26 August, and there was a strong linear relationship between δ2Hfur and δ2Hprecip in bats collected during this time. There was substantial variation in the migratory movements of this species. 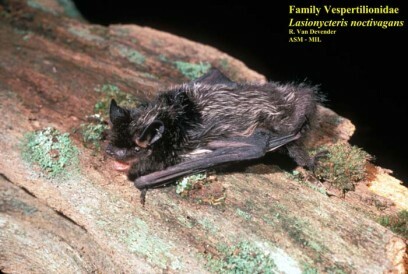 Twenty-four of 38 females and 14 of 30 males showed isotopic evidence of leaving the area where fur replacement occurred (i.e., migrating across latitudes), whereas the remaining bats were either sedentary or moved at a small spatial scale. Males appeared to migrate consistently, regardless of latitude of origin, whereas there was a partial leapfrog pattern in migratory movements of females. To our knowledge, this is the first evidence of leapfrog migration in bats.